Fashion Week Season is literally around the corner, with the first stop in New York from the 9th to the 16th of February. My favourite part of the fashion week season isn't the runway shows per se, but all the street style surrounding it, especially the models rocking their Model Off Duty style. Even though they are running from show to show during the hectic fashion week season, they always manage to look stylish and cool. I've always been inspired by their street style, in between the shows, and really admired the fact that they always looks so polished and chic, while still working 24/7. So I took that as my inspiration for today's post and prepared some tips to help you achieve that perfect Model Off Duty look. The first and most important tip is to stick to the basics that always work together. So monochrome outfits consisting of t-shirts, jumpers, leather jackets, trousers or jeans are the way to go. I decided to pair my favourite girlfriend jeans from Pimkie with a grey crop turtle neck top and a leather biker jacket, both from Zara, to achieve a casual, minimalistic look. While being on-the-go 24/7, you definitely have to take care of the comfort factor, because nobody likes to run around in really uncomfortable clothes. That's why I decided to wear my trusted girlfriend jeans from Pimkie, which make the entire look very comfortable. The (heeled) ankle boot is the perfect option to add some height, but still making the outfit look cool and casual. Regarding the accessories: I chose a black leather backpack (because I like to carry a lot with me on a daily basis) and "embellished" it with a simple burnt orange scarf and Daniel Wellington watch. I think every woman would like to have that model mile-long legs. 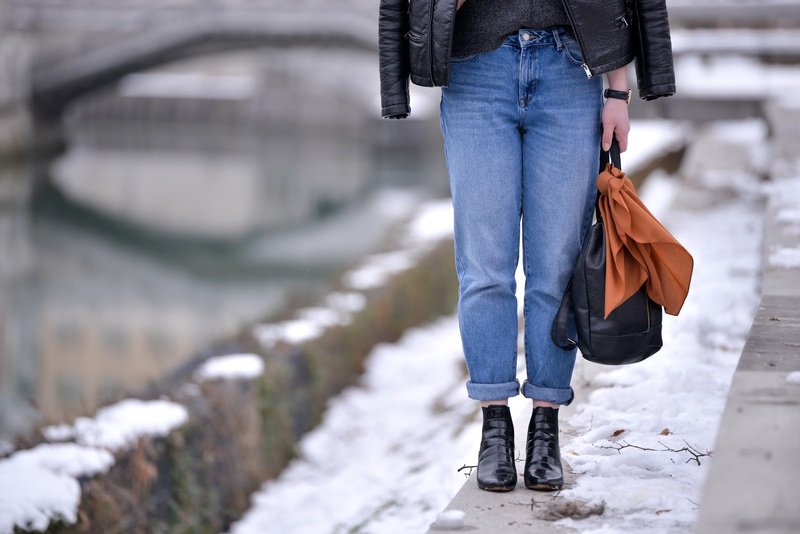 So if you want to accentuate your legs and make them appear longer, then opt for a pair of high-waisted jeans in combination with a simple crop top. I found my crop turtle neck top (a big trend of F/W) in Zara. A leather biker jacket adds the perfect amount of cool to a basic, minimalistic look. Drape your leather jacket over your shoulders for a feminine style twist to jeans and a simple top. Sunglasses (I found mine at H&M) add an interesting detail and that coolness effect to the outfit, but also hide the fact that you're wearing absolutely no make-up. I call that a win-win situation. Sleek but effortless hair will tie the whole look together perfectly. It takes you only a few minutes in the morning to do it, but makes you look like you've spent hours on it. In love with this perfect basic look! Comfort factor ;). Simply the best.